This reference architecture provides guidance for deploying vSphere Integrated Containers (VIC) on VMware Cloud Foundation (VCF) in a validated solution consisting of Dell EMC* and Intel hardware. Developers today are driving businesses toward adopting containerized applications as a way to accelerate software delivery. Containers help developers quickly iterate applications through ...development cycles and improve business competitiveness by enabling a quicker time to market for new services. However, for businesses to put these quickly developed applications into production, the applications need to meet advanced security requirements that containers do not inherently meet on their own. Traditional applications that are hosted in virtual machines (VMs), on the other hand, do provide a higher level of security through operating system (OS)-level isolation and the reduced attack surface of a hypervisor. For these reasons and others, applications hosted in individual VMs remain widespread in production environments. This situation presents a problem: how can businesses provide the same level of security offered by hypervisor-based workloads while also offering the advantages of container-based applications in the development cycle? And how can a single environment support both types of workloads in a simple way? VMware Cloud Foundation, based on VMware vSphere, provides a cloud platform that meets advanced security needs for VM-based workloads. By adding VMware vSphere Integrated Containers to this environment, businesses can deploy containers, too, on the same hypervisor. This strategy extends the advanced security features of VM-based workloads—such as role-based access control, identity management, and operating system (OS)-level isolation—to containerized applications. 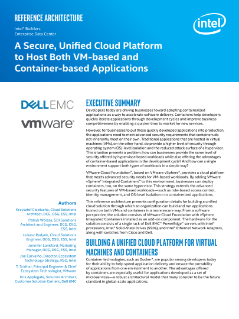 This reference architecture presents configuration details for building a unified cloud solution through which an organization can build and run applications hosted on both VMs and containers in a more secure way. From a software perspective, the solution consists of VMware Cloud Foundation with vSphere Integrated Containers installed as an add-on component. The hardware for the solution consists of a single rack of Dell EMC PowerEdge servers with Intel processors, Intel Solid-State Drives (SSDs), and Intel Ethernet Network Adapters, along with switches from Cisco and Dell.